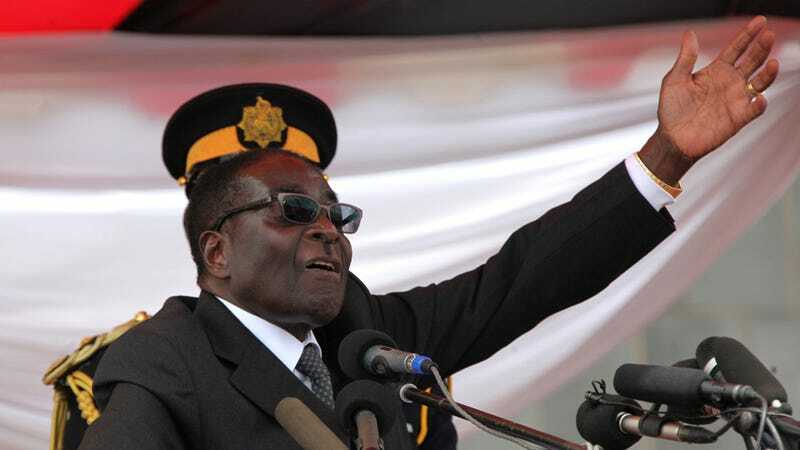 Whose great idea was it to invite Robert Mugabe, Zimbabwe's sexist, homophobic, and all-around crazy 88-year-old dictator to a conference today on HIV/Aids and gender rights? Unsurprisingly, Mugabe — who banned homosexuality from his country — made many lovely and thoughtful contributions, such as how the "gay world" is unnatural because it takes away women's traditional rights to being mothers. "Mothers were given the talent to bear children. That talent doesn't belong to men," he said. "When God created Adam ... if Adam had desired a person like him it would not have made him any happier." Oh, right, don't you remember that part of the Old Testament where Mugabe and Adam bro'd down in the Garden of Eden? "When a man says he wants to get married to another man, we in Zimbabwe don't accept it," he continued. "We can't talk of women's rights at all if we go in that direction. It will lead to extinction," he said. Yet, he added that women would never have equal representation in Zimbabwe. "Our customs look down on women as inferior," he explained. "Men pay cattle and money to get a wife and expect women to obey them. Women will surely lose. Men say that women are not as knowledgeable as us. The attitude of men still despises women." he said. Ah, yes, the attitude of "men."